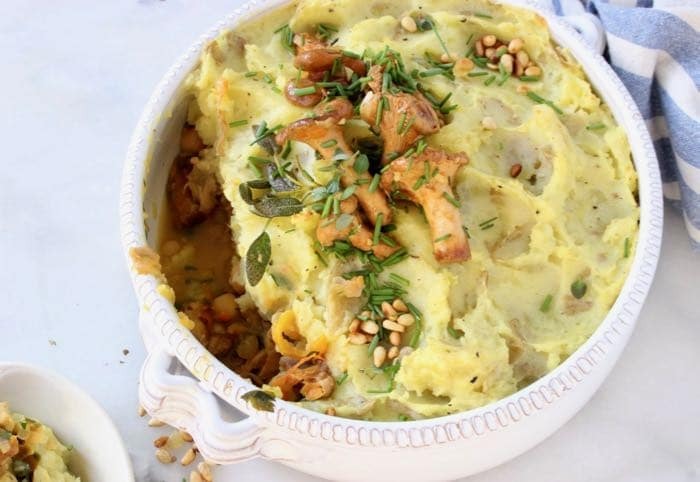 To die for easy vegan Shepherd’s pie made without lentils and using meaty flavorful chanterelle mushrooms and peas instead. Two words friends: Chanterelles and Potatoes! Everything happens on the stove top and finished for a couple of minutes under the broiler flames. Perfect for Thanksgiving If you ask me, especially because it is such a comforting dish that can be made ahead. Warm it up before company arrives and dinner is served! 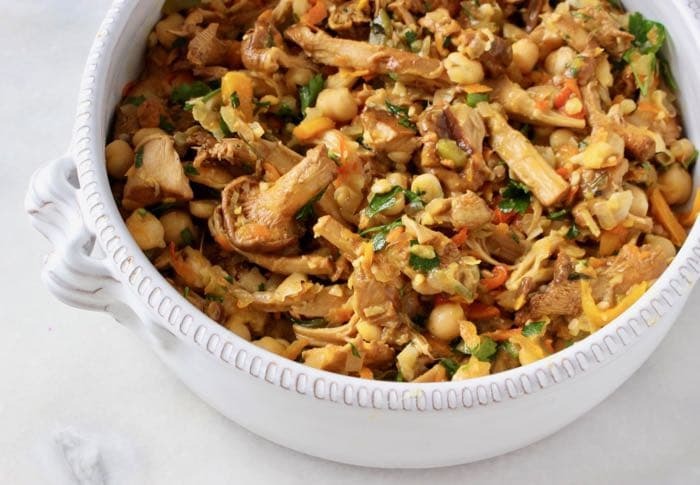 I didn’t want to get too crazy with the flavors so I added some chickpeas for extra protein, but you can stay a little bit more traditional and add green peas instead. 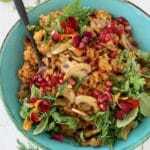 Anything from cannellini, black beans and lentils would work nicely here, so feel free to let your creativity shine! The recipe calls for golden potatoes, however I’ve made this with a sweet potato mash before and it was also really delicious. Hope you love this as much as we do, and If you give it a try please let us know in the comments and tag your photo with #VeggieSociety on Instagram. 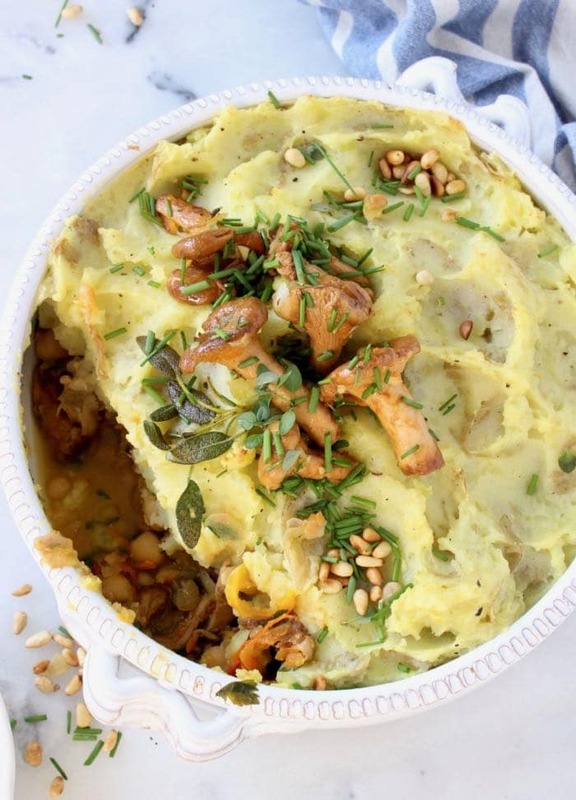 To die for easy vegan Shepherd's pie with mushrooms and herbs. Rinse and scrub the potatoes well then cut them into 1 inch cubes. Add them to a large pot and completely cover with water. Add the bay leaves and chopped garlic and bring to a simmer. Generously season with sea salt ( water should taste like sea water) and boil until tender, about 15 minutes. Drain, discard the bay leaves and transfer the potatoes to a large bowl. Add the warm milk, olive oil and nutritional yeast and using a whisk or potato masher combine and mash until fluffy and smooth to your liking. Taste and adjust seasonings with more sea salt, nutritional yeast and black pepper. Stir in the chopped chives and set aside. Heat up your largest skillet over medium low flame and add the 2 teaspoons of olive oil. Add the onion with a pinch of sea salt and cook for about 15 minutes until they start to caramelize, making sure to stir often. Add the carrots and peppers and cook a few more minutes until they begin to soften. Stir in the chopped sage, rosemary and thyme. Rinse the mushrooms well and allow them to drain in a colander. Add them to the pan with the onion making sure to shred the large ones into thinner pieces. You can ad the tiny ones as they are. Add the splash of white wine or water and give everything a good stir. Simmer for a few minutes until the gravy has almost evaporated. Taste and adjust seasonings with sea salt. 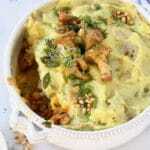 Stir in the green peas or chickpeas ( lightly mash them with a fork first) and add the filling to a broiler proof dish. Reserve some mushrooms for garnish If you like. Spoon the garlic mashed potatoes on top and spread them out with the back of a spoon. Optional: Transfer the pie under the broiler for a couple of minutes to get some browned crips potato edges. 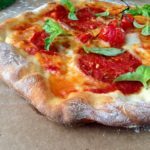 Make sure your dish is broiler proof first! 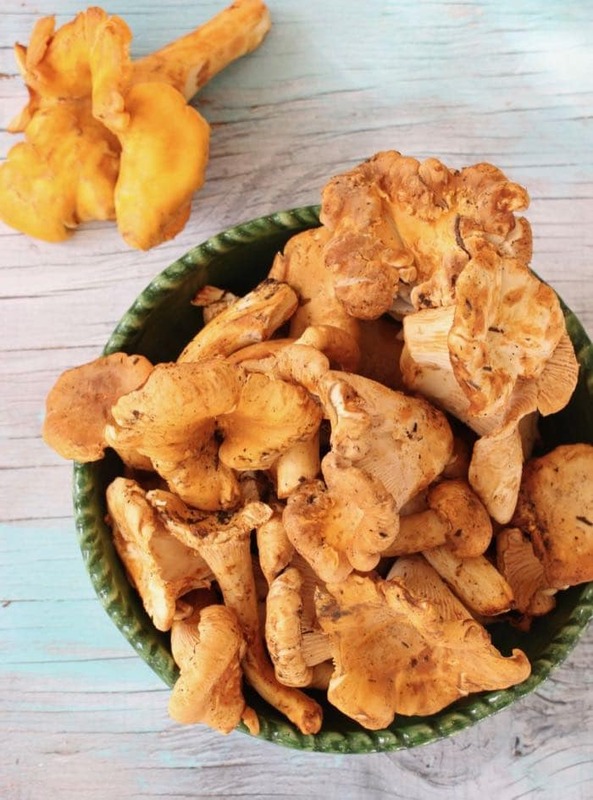 Serve garnished with the reserved chanterelle mushrooms on top, a good sprinkling of chives and the toasted pine nut. Optional: Add a drizzle of olive oil to a small skillet and crips up the sage leaves for a couple of minutes. Season with a tiny pinch of sea salt and serve on top of the potatoes. This was a hit with the family, I used both garbanzo beans and green peas. Will definitely make it again. Thank you for sharing!